'Year of Cinema' in 2016 will include many promotional events. Russia's cultural calendar has moved forward from literature this year to movies next - with the official launch of the 2016 Year of Russian Cinema in St. Petersburg this week. Vladmir Medinsky, the Russian Minister of Culture, officially inaugurated the Year of Cinema at the opening Dec. 14 of the IV International Cultural Forum in St. Petersburg. The ministry's main credo is not to promote specific values, but to create the conditions for the development of a multi-faceted culture, Mr. Medinsky said. Commenting on the results of the Year of Literature, the culture minister noted that initial data from Russian publishing houses suggest that book sales this year will be higher than in 2014. “This runs counter to global tendencies. Everywhere else the volume of print sales is either decreasing or being replaced by e-books,” Mr. Medinsky said. Speaking about the upcoming Year of Russian Cinema, Mr Medinsky said that some Russian movies would be shown on preferential terms in China, similar to conditions for domestic movies in that market. 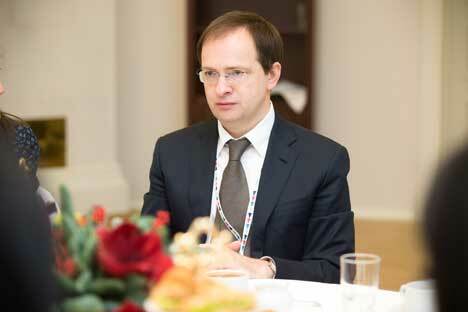 “The future belongs to co-production, it will expand the [Russian] market,” he added. The key event of the Year of Russian Cinema would be a 'film night' scheduled for late August. Many cinemas will also show Russian films free of charge during the year. To mark the 120th anniversary of the first screening of a film in Russia, a new studio will be opened at Lenfilm studios in St. Petersburg, the minister said.